Lean Thinking: Reprise - Why Lean Outside the Factory? Reprise - Why Lean Outside the Factory? 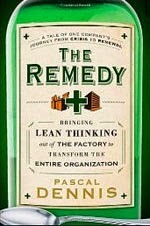 I wrote a book about it – (The Remedy). Why did I bother? Because Lean is about reducing waste & variation -- and most of it is outside of the factory. The past few decades, factories, and Operations in general, have gotten better and better. There’s still much opportunity, but in many industries they are no longer the bottleneck. Suppose you order a new Toyota Avalon, Total lead time (i.e. time between your order and delivery) will be something like 30 days. How much of that time does the vehicle spend at the Toyota Kentucky factory? A day or so. Most of the lead time is outside the factory and comprises administration, transportation, and plenty of waiting. So where is the opportunity? Sales, Marketing, Design, Engineering, Finance and so on are the "undiscovered country". How do we support the good people in these areas? Here are a few questions to get us started. 3) What are some core mental models?